Angel shines with La Part des Anges in 2007. La Part de Anges, 2007. Created by Brosse Master Glassmakers in France. Large Swarovski encrusted Metal neckline, dark blue base. Retail Price $ 220 US dollars. 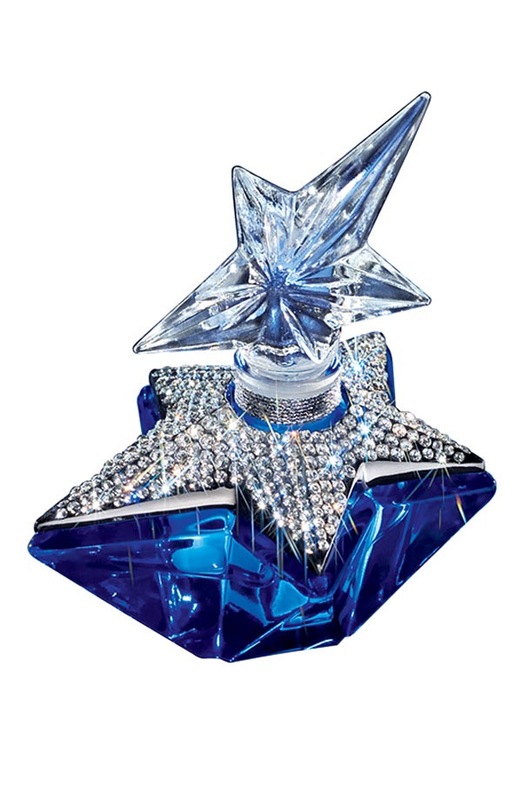 The exquisite fragrance is contained in a sparkling precious star, dressed with Swarovski crystals on the top of the base in celebration of Angel’s 15th anniversary. This is one of the best and better valued limited editions because of the amount of crystals it has on the metal base. Unfortunately for collectors this was issued in a product run of 4742 bottles, which is really large number. Stay away from anything over 1,000. What I like least of this bottle is that its shape is going to be overused in the future about eight times! 2007 La Part des Anges, and Caprice de Star. 2013 Excessive Star (Both these 2013 are almost identical). 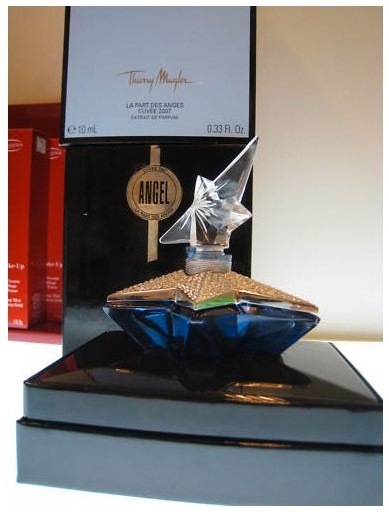 Since this year they celebrated the 15th anniversary of the release of Angel, they created more than one limited edition, as they had done so before in 2002 when they celebrated the 10th year of Angel. In 2002 they also released three differrent limited edition bottles. This was also the first time they created a Cognac style fragrance of Angel by aging it in wooden barrels. A certificate of authenticity is provided, and each bottle is engraved with its individual number. 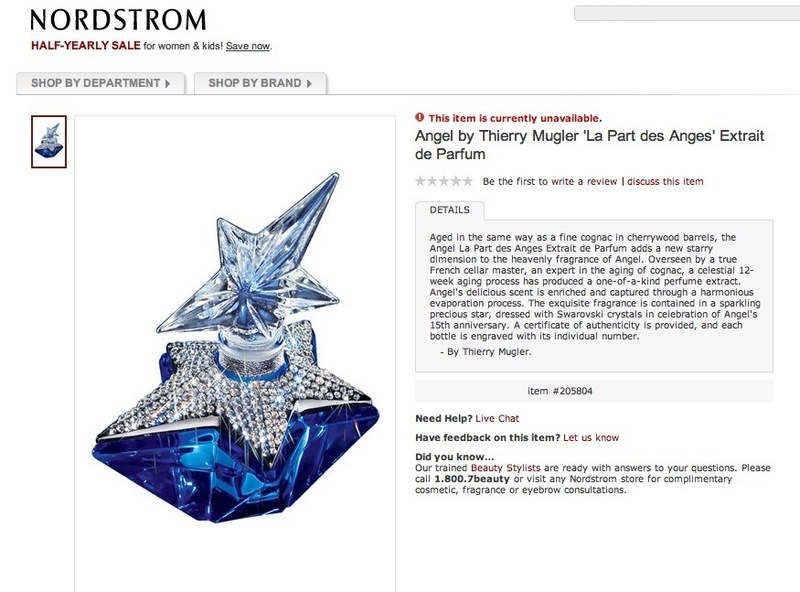 Photos of Thierry Mugler’s La Part des Anges Perfume Bottle. Top view showcasing the Swarovski filled bottle neckline. 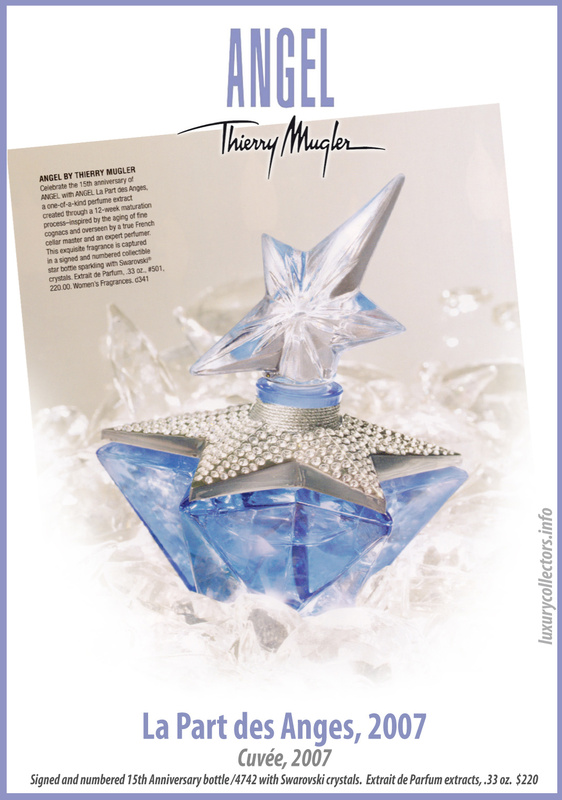 Advertisements of Thierry Mugler’s Part des Anges Perfume Bottle. 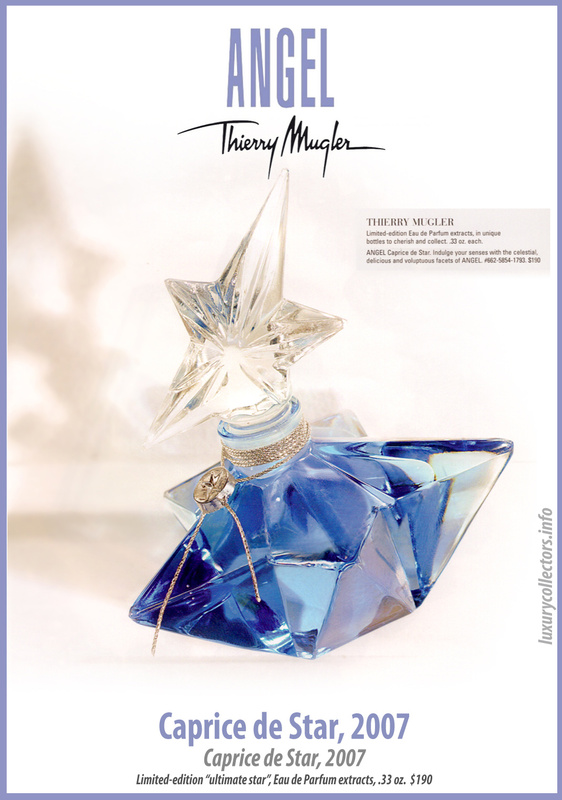 Scan from a 2007 Saks Fifth Avenue or Bloomingdales holiday catalog showcasing the price of the bottle. Screenshot from Nordstrom.com detailing the specs of the bottle. 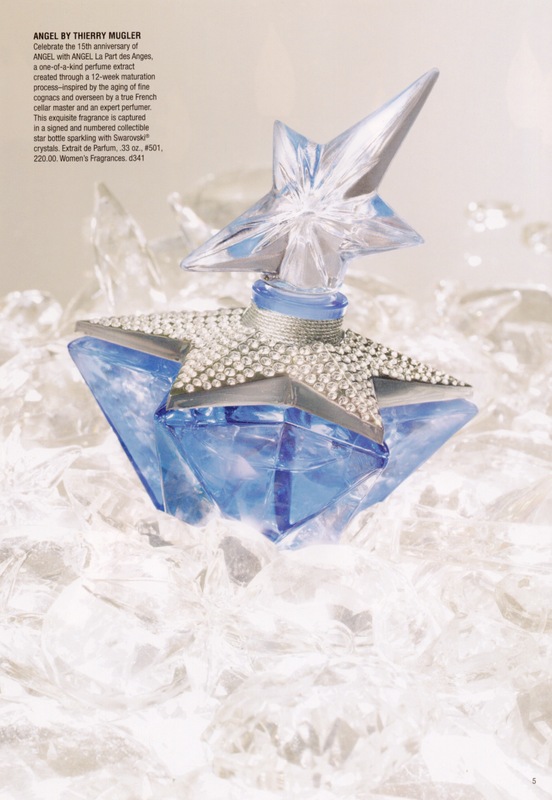 Great Scan from a 2007 Neiman Marcus Holiday catalog. 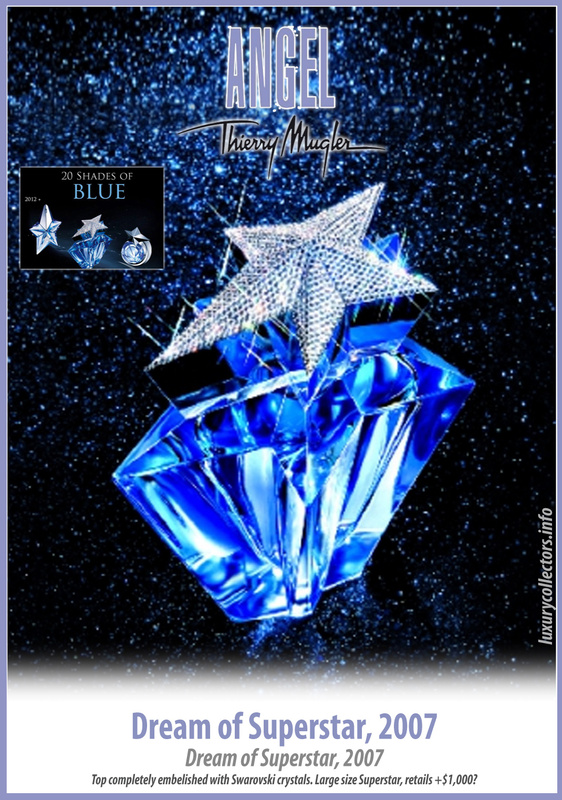 Photos of Thierry Mugler’s La Part des Anges Box Presentation. A little common and similar to the first bottle released, no velvet touch in this edition. I have not been able to confirm if its numbered and how many where made, please leave a message if you have the certificate of authenticity, thanks. 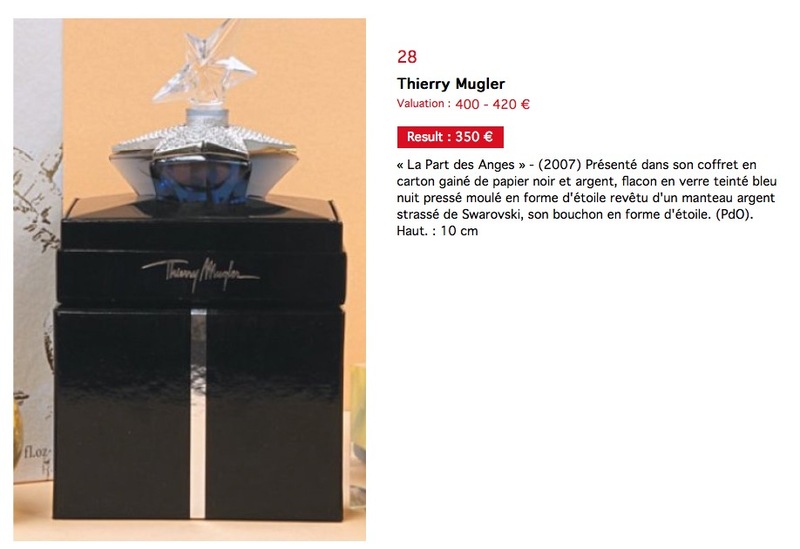 From an french auction catalog page. This photo shows the name Cuvee 2007 on the outer box.